Once per turn: You can Special Summon 1 "D/D" Tuner from your Deck, and make it Level 6. After this effect resolves, you cannot Special Summon monsters from the hand or Deck for the rest of the turn, except by Pendulum Summon. Once per turn, during your opponent's turn, you can (Quick Effect): Inflict 500 damage to your opponent for each "Dark Contract" card you control. Immediately after this effect resolves If you would take damage, you can make 1 face-up monster on the field lose exactly 500 ATK instead. And I would like to point out that ALL TOKENS COUNT AS NORMAL MONSTERS. Seriously though, it's like Vanillas are getting all the love now. And Tokens. Especially with that Effect Monster drain specifically targeting your opponent. It's niche but the nice type of niche. Your opponent must pay 300 LP to Special Summon a monster(s). All monsters your opponent controls lose 300 ATK for each card you control. Once per turn, if a monster effect is activated while your opponent controls more cards than you do: You can negate the activation, and if you do, inflict 300 damage to your opponent. Lore: You can discard this card; add 1 "with Chain" Trap from your Deck to your hand. You can only use this effect of "Red-Eyes Hunter with Fangs" once per turn. 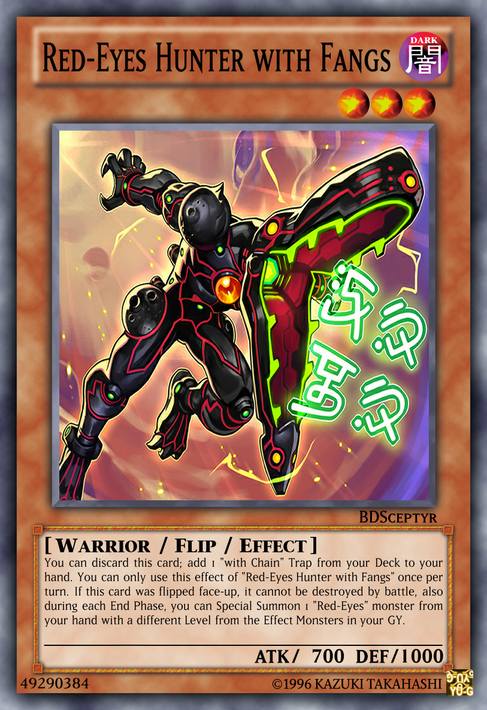 If this card was flipped face-up, it cannot be destroyed by battle, also during each End Phase, you can Special Summon 1 "Red-Eyes" monster from your hand with a different Level from the Effect Monsters in your GY. 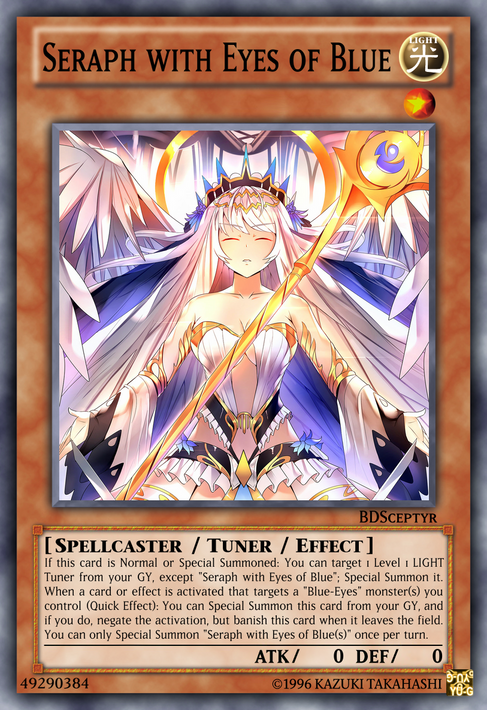 Lore: If this card is Normal or Special Summoned: You can target 1 Level 1 LIGHT Tuner from your GY, except "Seraph with Eyes of Blue"; Special Summon it. When a card or effect is activated that targets a "Blue-Eyes" monster(s) you control (Quick Effect): You can Special Summon this card from your GY, and if you do, negate the activation, but banish this card when it leaves the field. You can only Special Summon "Seraph with Eyes of Blue(s)" once per turn. 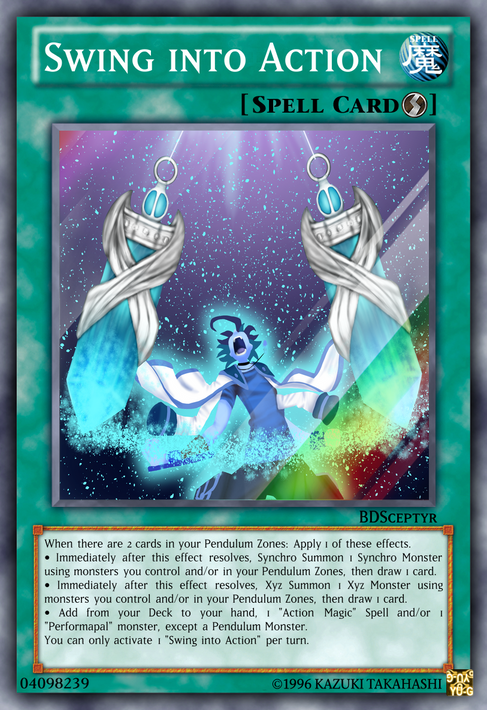 Once per turn: You can detach 1 material from this card, then reveal 1 Ritual Monster from your Deck or 1 Fusion Monster from your Extra Deck; activate 1 of these effects. • Special Summon 1 monster from your hand with the same Attribute as the revealed monster, but it has its effects negated, also draw 1 card. • Normal Summon 1 monster from your hand with the same Type as that revealed monster as an additional Normal Summon. Well, I'm back. And I've got some more stuff fresh out the Workshop for you all to indulge in. Like this creature named after a gem too fragile to be used for gemstonin', but just great enough to shine brighter than a diamond. Descrip's all in here. ..giving Lev2 Decks, Paleo and Ojamas especially, a way to better tutor out their hand without having to hold out for a Saryuja is the bomb and you'll easily see how so when that Normal Summon caveat kicks in. Special Summon basically happens at a -0 cost and negated effects don't matter a damn if the thing isn't staying on the field long, Summon Sorceress has already proven that. Until the next card folks, reviews, revelry, you know the drill. Because there's already a meta Deck around whose main playmaker is banishing your opponent's hand and drawing them an entire new one that'll go right into Tier 0 territory if they can follow it up with a Trap Trick tutored Drastic Drop Off On Steroids over here? I mean, Trickstars already swept Worlds once before, why is everyone so eager to effortlessly hand them another one? Like, I've had issues with restrictions too, but one sniff of this with your buy-in being added into the draw and they'll ban every hand-fixer by Sunday morning. That being said, this can actually make those Saryuja plays regrettable, and that's fine by me. 7.1/10. "alright Brain, what do you want to do today?" "since we've already done a Spooky Scary Skeletons nametwist for one post and a Ghostbusters ref for another, the same thing we do every other night, Pinky-try to take over the world!" Lore: You can Ritual Summon this card with "Gravekeeper's Passover". While you control this Ritual Summoned card, your opponent cannot target "Necrovalley" cards you control with card effects, also they cannot target "Gravekeeper's" monsters you control for attacks, except this one. Any monster that would be sent from the hand or field to the GY is shuffled into the Deck instead, except "Gravekeeper's" monsters. If this card is sent from the field to the GY by a card effect: You can destroy up to 2 cards your opponent controls. Lore: This card can be used to Ritual Summon "Gravekeeper's Excommunicator". You must also Tribute monsters from your hand or field, and/or Tribute 1 monster from your Deck that specifically lists the card "Necrovalley" in its text, whose total Levels equal 9 or more. 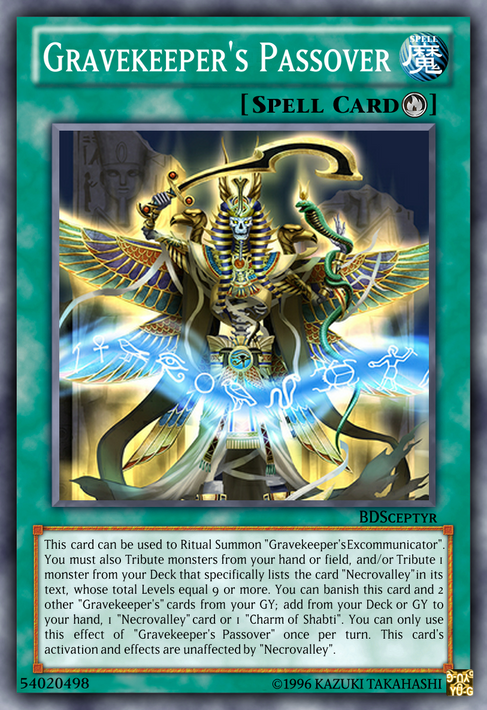 You can banish this card and 2 other "Gravekeeper's" cards from your GY; add from your Deck or GY to your hand, 1 "Necrovalley" card or 1 "Charm of Shabti". You can only use this effect of "Gravekeeper's Passover" once per turn. This card's activation and effects are unaffected by "Necrovalley". Second off, giving Gravekeeper's a Ritual is to round out them getting a Fusion-and it being Level 9 also fills out the one Level category between 2 and 10 they didn't already have on lock. So that's a nice milestone. And this card's effect is a wondrous millstone paired up with Supernaturalist - now The Most Anti-Meta Field Spell in The World can't be targeted with card effects or be destroyed. Third, sweeping all attacks into the face of the 2500 ATK beat-stick that takes two cards down with it if it dies? Priceless. Even more so if you use Passover to get your battle-immunity totem, the Charm of Shabti, into the hand. WHICH I GUARANTEE NONE OF YOU KNEW EXISTED TILL THIS POST This concludes your History in Powercreep lesson from the BlaDeS of Change Workshop. P.S., I'll be off helping to plan a wedding, so don't expect another Advanced card until the start of my Spring Break next week-and in that case, I will have one here for each day off. As a treat to you all for sticking it out here on YCM. Until the next card; reviews, revelry, you know the drill. And as is true in all things good and free, the greatest stampedes always start with three. 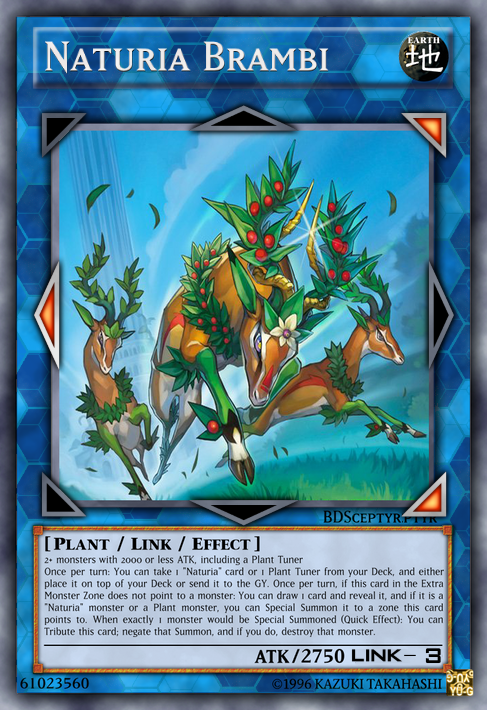 Once per turn: You can take 1 "Naturia" card or 1 Plant Tuner from your Deck, and either place it on top of your Deck or send it to the GY. Once per turn, if this card in the Extra Monster Zone does not point to a monster: You can draw 1 card and reveal it, and if it is a "Naturia" monster or a Plant monster, you can Special Summon it to a zone this card points to. When exactly 1 monster would be Special Summoned (Quick Effect): You can Tribute this card; negate that Summon, and if you do, destroy that monster. Can't go wrong with negating a Summon. And the circuitous nature it goes about bringing another Plant Tuner to the board can easily be used to your advantage, especially with their quick recovery in the GY. And a hefty 2750 ATK to mop up if the opponent decides to sit on their board. 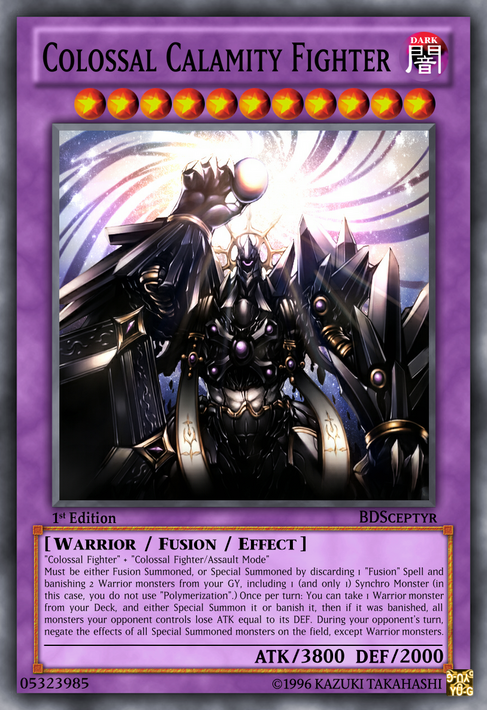 Lore: "Colossal Fighter" + "Colossal Fighter/Assault Mode"
Must be either Fusion Summoned, or Special Summoned by discarding 1 "Fusion" Spell and banishing 2 Warrior monsters from your GY, including 1 (and only 1) Synchro Monster (in this case, you do not use "Polymerization".) Once per turn: You can take 1 Warrior monster from your Deck, and either Special Summon it or banish it, then if it was banished, all monsters your opponent controls lose ATK equal to its DEF. During your opponent's turn, negate the effects of all Special Summoned monsters on the field, except Warrior monsters. Like Rainbow Neos, make a Fusion that requires a specific monster or its Dark Counterpart version as 1 of the Fusion Materials. The catch? It can't be Rainbow Dragon or Warrior Dai Grepher. This revenant of rot has been shambling the earth for as long as humanity has known. Rumored to be the first of the royal bodyguards of Egypt, its ability to necrotize the flesh of anything it touches and hyper-regenerative powers makes it an almost impossible foe to even approach, let alone apprehend. Artwork is worthy enough to deserve a like, but your card is pretty cool too. Considering, however, the fact how such a versatile card provides so much advantage, perhaps adding a restriction or cost to the card wouldn't be such a bad idea. Did you have an idea on where to start? I thought the Summoning thing might be the biggest issue, but then thought of the number of Decks that profit on turning out the entire hand through Special Summoning (cough!Danger!cough!) to think it might be balanced on a non-Turn-0-Trap. Lore: Apply 1 of these effects. 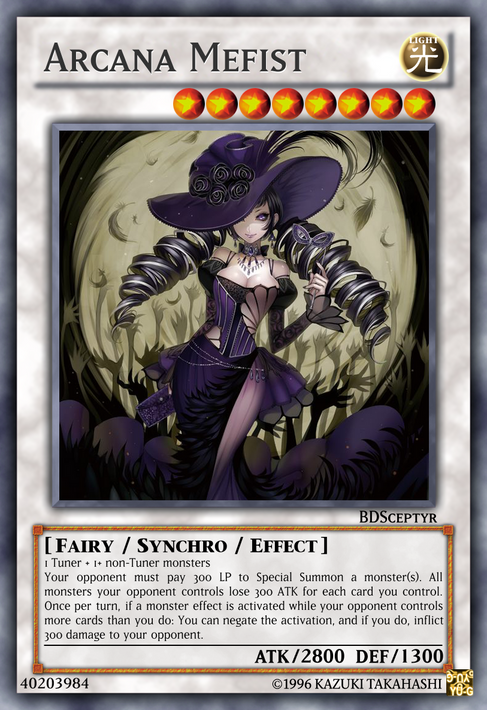 • Immediately after this effect resolves, Synchro Summon 1 Synchro Monster using monsters you control and/or in your Pendulum Zones, then draw 1 card. 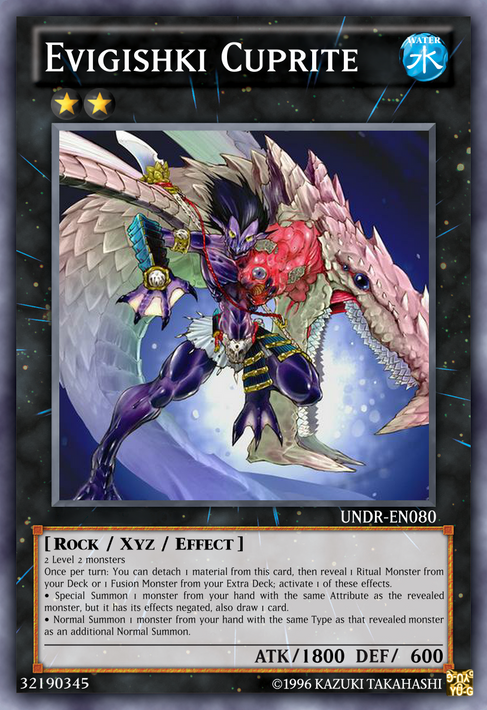 • Immediately after this effect resolves, Xyz Summon 1 Xyz Monster using monsters you control and/or in your Pendulum Zones, then draw 1 card. • Add from your Deck to your hand, 1 "Action Magic" Spell and/or 1 "Performapal" monster, except a Pendulum Monster. You can only activate 1 "Swing into Action" per turn. Fills in the blanks of Extra Deck Summoning that Pendulum Fusion did not, and ties into our favorite tomato-haired attention sink, Yuya, by allowing it to literally 'swing into' Action Spells and Those Performapals Almost Nobody Uses. It giving off extra draws is, I'm afraid, the price of admission, as this is not searchable and normally, Pendulums are already resource-intensive enough without demanding you bomb your Scales for no equivalent value. Goodness, even Wavering Eyes isn't enough to serve up drinks with these days, +1ing will likely need to be the spice of life for non-Archetypal tech that isn't a A) Trap, B) handtrap or C) something that counters em' to ever see use. So do these ladies have any synergy with current spellcaster support floating around? Jolly Glot mentioned the Invoked and Spellbooks, but most of that focuses on the Spells anyhow. My pick would be the Windwitches; these cards don't use the Extra Deck at all, and it can lead to a destruction-proof Crystal Wing to protect your Witchcraft that you turn into either Heine or Verre to continue the disruption/destruction. Also, the Hands and Restage look dope for reviving Poterie and Pittore.